Keith Pinkerton, owner of Pinkerton Electrical Service, Inc., started his Mr. Electric of Huntsville franchise in November of 2003. As a licensed electrical contractor, Mr. Electric provides a variety of residential and commercial electrical services such as repair, installation and replacement of ceiling fans, recessed lights, electrical plugs, electrical panels and security or landscape lighting. The company also does electrical remodeling for your entire home and provides 24/7 emergency service through an on-call service professional, as well as a back-up service professional. From the moment you make contact with Mr. Electric, you will be treated with the utmost respect and professionalism. All incoming calls are handled in a timely manner, and a dispatcher will call you once the service professional is in route to your home. Upon arrival, the bright yellow Mr. Electric van will be parked on the street in full view of your front door. A doormat will then be placed outside the entry way, and the service professional will put on shoe protectors before entering your home. Once a 12-Point Home Safety Inspection is completed, a quote is provided and approved before any work is performed. Of the 200+ Mr. Electric franchises worldwide, in 2006, Pinkerton received the, Mr. Electric Franchisee Excellence in Leadership Award – a recognition he says is indicative of his team’s dedication and commitment. 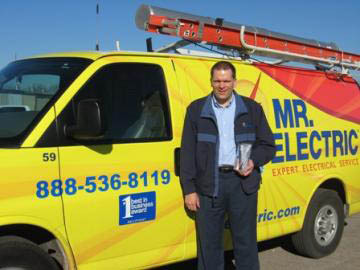 Most recently, the Mr. Electric of Huntsville Team was name Mr. Electric’s 2008 Franchisee of the Year, the highest honor a franchisee can receive, for showing consistent growth through proper training and management, consistent sales volume and quality customer service. Mr. Enclosure Enclosed Patio and Sunrooms Lithographics, Inc.